Security continues to be a key concern for boards and organizations in 2014. Board governance continues to remain in the spotlight with corporate governance failings and oversight issues regularly being reported in the media. With the threat of reputational damage, cost of remedial action then required along with fines, organizations simply cannot afford to make the wrong decisions.As new risks emerge and grow, such as cybersecurity risk, organizational success increasingly relies on the board receiving the information needed to make critical business decisions. 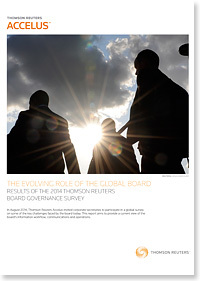 In August 2014, Thomson Reuters Accelus invited corporate secretaries to participate in a global survey on some of the key challenges faced by the board today. Download the results report and view the infographic for a current view of boards' information workflow, communications and operations. Complete the form on the right to download the 2014 Board Governance Survey Report. Please fill in your contact details in the form below to download the report. Risk Management Solutions bring together trusted regulatory, customer and pricing data, intuitive software and expert insight and services - an unrivaled combination in the industry that empowers professionals and enterprises to confidently anticipate and act on risks - and make smarter decisions that accelerate business performance. Visit risk.thomsonreuters.com for more information. © 2016 Thomson Reuters. All rights reserved. Thomson Reuters Accelus BoardLink is a secure, web-based board portal, accessible online or via an iPad app 24/7. BoardLink enables corporate secretaries and board members to communicate and access critical business intelligence and board materials, empowering decision-making and good corporate governance.